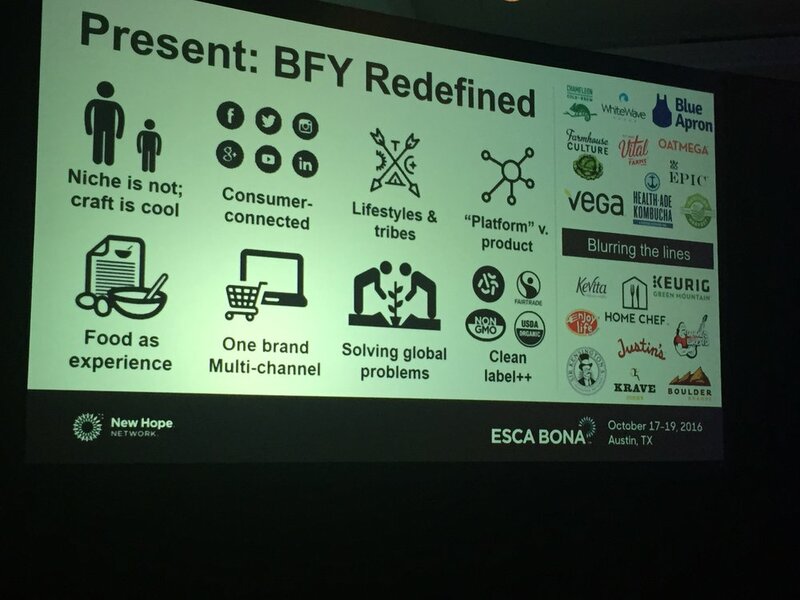 If Elon Musk is in a race to Mars, Esca Bona is in the race to hack the Good Food Future. The conference was held last week in Austin last week. And its vision was bold: to map the best ideas on how we can build and scale a new kind of food system. One that’s better for both people and planet, and massively available and affordable to all. Before you pooh-pooh this type of thinking as far out or fringe, consider this: these are some of the very same folks who ushered in our current obsession for things like kale chips, chia pudding and quinoa. So what rose to the top of this “Best Idea Blitz”? 1. Crickets as an Ultra Clean Protein. Crickets they are worthy of deep attention because they sit at 4 vital intersections of better food: sustainable protein, ethical animal treatment, social impact and climate resilience. This likely explains why the McGill students who launched Aspire Food Group around a global edible insect movement won the prestigious Hult Prize from the Clinton Foundation in 2013.When I popped my first-ever intentional insect into my mouth, I have to admit I was a bit terrified. But to my relief, I discovered that whole roasted, seasoned crickets are crunchy and tasty, and surprisingly un-squeamish. And I know my kids (and I'm guessing all kids) will go ga-ga over them. Chapul is a company already ahead of the trend - selling cricket protein and other cricket-based foods. And, Aketta is selling whole roasted crickets and cricket flour. 2. The Rise of “Positive Processing”. At first blush this may sound like an oxymoron. But processing will play a vital role in our healthy food future: it’s a lever that can help good food scale. If there’s a company doing it right, it’s Back to the Roots. The two founders are shrinking the whole “what you buy at the store vs. what you can make at home” divide further, creating an impressive playbook that will likely light the way for this new trend. It includes clear and simple sourcing statements telling consumers where ingredients come from, ultra short (3-4) ingredient lists that disclose the % amounts of each item, and an innovative “no bag in box” approach which uses 18% less paper and 25% less plastic (all according to the company website). It’s worth watching as a model, as this radically transparent approach undoes much of the criticisms that have long plagued the cereal category - such as impossibly long or hard to understand ingredient lists, or using several different sweeteners to cut costs that make it confusing to know how much added sugar is in there. Well done. 3. The Triple Play of Regenerative Agriculture.One of the biggest opportunities to create a better food system sits right beneath our feet. How can we up our intake of good-for-us plants that also play an essential role in revitalizing soil? Nitrogen fixing peas, cover crops like clover and barley, and biodynamic farming principles are leading the way in this kind regenerative thinking. Quick wins such as soil regeneration and carbon sequestration, diversifying our diets with new crops, and increased profitability for farmers can all draft off of this approach. Tyler Lorenzen, President of World Food Processing, shared how their farmers are planting peas as profitable cover crops (some of which his company buys and uses to make plant protein) and also do the neat trick of fixing much of the nitrogen per acre required for their crops right back into the soil. This not only restores the soil and boosts production of a mighty legume linked to incredible health benefits , it saves financial and environmental costs associated with synthetic nitrogen fertilizer during the next growing season. I think this category is a huge opportunity for innovation across the whole spectrum-from farmers to brands to nutrition policy. Biodynamic farming is a regenerative farming model that moves beyond organics. Saw Mill Hollow is revitalizing the economy of rural America through the power of organic small scale farming, using a jewel of an American superfood-the aronia berry. Barnrasier is a group of thousands of innovators pitching in to change how we eat and live - in many ways that profoundly revive local communities. IQ (intelligence quotient) + EQ (emotional quotient) +VQ (virtue quotient). In fact, that there are now firms who specialize in “auditing” your numbers to be sure you have truth and transparency in the claims you make. It’s also no longer enough to focus solely on the well-being of the end consumer: the best companies today understand their product must create better health and better opportunities for everyone along the supply chain, including those most vulnerable and most at the margins of our current system. Here's where things start to become a bit more muddled. If the initial wave of the “good food” movement brought us things like cleaner ingredient lists, higher quality meats, re-imagined veggie burgers bursting with taste and beneficial ingredients, and refreshing nut milks into the dairy case, this next wave feels different. After those relatively quick wins, we’re entering what the founder of Perfect Day Foods called “Vegan Food Tech 2.0": fueled by a mashup of tech and food, this next revolution has set its sights on vegan products that seek to mimic the look and mouth-feel of meat, make cow’s milk (using a sort of "cellular agriculture" via a crafting process similar to beer), and other mind boggling innovation. Fortune called it "cellular agriculture." But if crickets fall neatly into the neat box of "whole, real foods straight from nature” the health advantages of Vegan Food tech 2.0 are less clear. Yes, the intentions are noble, and the vision an inspirational and positive one (find a new model to replace large scale animal agriculture). The innovators who are at the forefront of this trend are breaking rules, boldly experimenting and cross pollinating fresh ideas across industries...all of which may just unleash the next big breakthrough in how humans eat. And without question, it’s good to have as many minds in the mix as we can as we seek to make good food even better. But will these highly engineered plant products deliver the same deep and compelling health benefits we know come from a plant based diet based in whole plant foods? Will our body, our DNA code, our microbiome recognize and embrace them? Will they up-regulate health and longevity? Or are they a well intended guess (as trans fats once were), based on the best science we have at the time, that may have unintended consequences down the road? And what to make of the multitude of moral/ethical/labeling questions that arise from things like (as Fortune explained of Perfect Day's process) obtaining a cow’s DNA sequence, printing it using a 3D-printer (yes really), and inserting it into a specific location of onto yeast so that it begins fermenting sugars to make milk proteins? And how does this newer, buzz worthy vein of the good food movement, which runs deep into the tech world and all of the money that’s sloshing between them, square with the competing vision which emphasizes the bevy of benefits of eating lots whole foods straight from nature? Time…and lots more research, will tell.